Indian Food delicacy is filled with variety of dishes which I should mention as Innumerable. 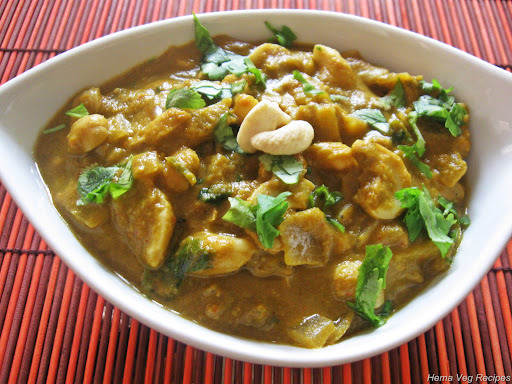 Indian specialty Cashew nut curry is extremely delicious. 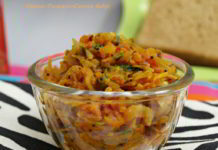 Even the diet conscious people excuse themselves to savour this yummy dish once in a while. I make this recipe at home and save a lot of money as in restaurants it costs more. Since I have already told you in another recipe how to use cashews I will not repeat here. Please refer “Malai Kaju Curry or Cashewnut curry”. 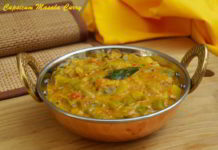 Now for this recipe of Kaju curry you need to keep ready chopped onions and tomatoe puree. Just follow the procedure I have given here and you make a tongue tickling Cashew nut curry. Chop the Onions. Keep aside. Chop the Tomatoes and grind the cut Tomatoes in a mixer grinder to prepare Tomato puree. Keep aside. 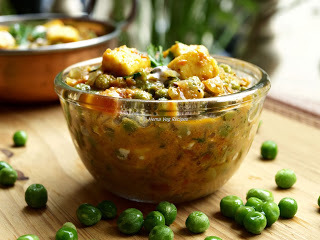 Add all the Kaju Curry Gravy Ingredients listed above to a mixer jar and grind it in a mixer grinder to a smooth paste. Heat Ghee in a pan, add Jeera. Once Jeera/Cumin seeds splutter, add chopped Onions from Step 1 and fry until the Onion pieces look a bit transparent. Then add Tomato puree from Step 2 and fry till the Ghee separates out from rest of the mixture..
Now add the ground Kaju Curry Gravy paste from Step 3 to the pan. Add water and cook for 5 min. Then add Khoa, Cheese, Cashew Nuts and Salt and mix all the ingredients ensuring they all blend well. Again cook on a low flame for 5 min and then remove from the flame. Now your delicious, lip-smacking Kaju Curry is ready to serve with Chapati or Naan or Kulcha. The recipe doesn’t mention when to add the cashew nuts. Please let me know. 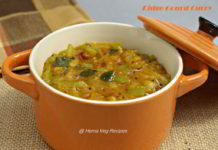 Oh thanks for recipe todays my MOM dads Aniversary and i suprised them by making KAJU CURRY. Thanks Shetall for letting me know. Nice to hear that you had a good time with your family. Its really great help in making any dish from your recipes, so thanks. HI Hema – I tried your recipe today (with an exception. I did not add khowa as it was not in hand today). The curry tasted sour thought over all it was good. I guess that was due to the tomatoes. Could you advise on how to remove the sourness when I make it next time? Monica – Try to add just one Tomato (instead of two) if you do not have Khoa at hand. That might reduce the sour taste in the Kaju Curry. Or else may be you can have more Cashews added to the gravy while grinding the ingredients for the gravy. Hope this helps.